Distinguished attendees included UN Secretary General Ban Ki-moon, Italy’s President Sergio Mattarella, Ecuador’s President Rafael Correa, Monsignor Marcelo Sánchez Sorondo and Cardinal Peter Turkson of Ghana. More than 100 experts, including religious leaders of many faiths, Nobel laureates from the worlds of science, politics and business gathered to show support for a global consensus on the urgency of limiting climate change and promoting sustainable development. Organized by the Pontifical Academy of Sciences, the workshop was held ahead of an encyclical letter on the environment that Pope Francis intends to release in June. It is completed and is now in translation. “The relationship between man and nature must not be governed by greed, manipulation and exploitation, but rather should preserve the divine harmony between creatures and creation, in the logic of respect and care, to place it at the service of our brothers and for future generations,” said Pope Francis. The Pope met with Ban for 30 minutes at the academy before the start of the workshop. The UN leader said they had “a fruitful and wide-ranging conversation” in private and that he looked forward to the Pontiff’s encyclical on climate change, which he said he believed would act as a moral voice on the issue. 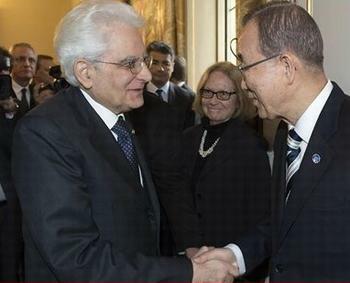 “During our conversation, Pope Francis spoke of his commitment to making the world a better place for all,” said Ban. 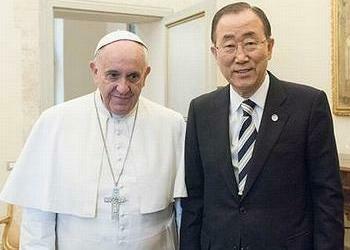 The UN chief thanked the Pope for accepting his invitation to address the UN General Assembly in New York on September 25. The workshop also precedes the UN Climate Summit in December in Paris, which is tasked with adopting a legally-binding global agreement to control Earth’s rising temperature. Addressing the workshop participants, Ban spoke of the urgent need to change human behavior to limit the temperature rise to 2 degrees Celsius above the planetary temperature at the start of the Industrial Revolution. This target was agreed by world leaders at the 2009 UN Climate Summit in Copenhagen. 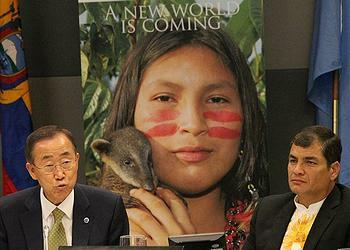 The UN leader said climate change affects everyone, but not equally. It is the poor, those who did the least to contribute to climate change, who are most vulnerable. “Around the world, I have seen how floods, droughts, rising sea levels and increasingly severe storms are causing terrible harm, and prompting families to migrate, often at great peril,” said Ban. “I have been to Antarctica, North Pole, Greenland, Iceland, Aral Sea. Anyplace you name, I have been there! In July I will be going to the North Pole again to see how much the situation has changed there,” he said. “To transform our economies, however, we must first transform our thinking, and our values. 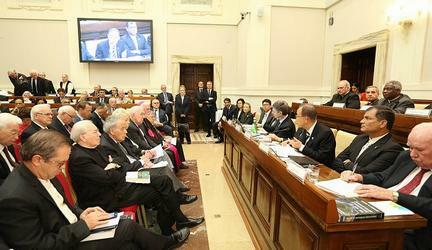 In this, the world’s religions can provide valuable leadership,” said Ban. “That was the Yasuni ITT Initiative that the world did not understand or would not understand,” said Correa today. At the UN in 2007, President Correa initiated the Yasuni ITT project, offering a perpetual suspension of oil extraction in part of the Yasuni National Park called Ishpingo-Tambococha-Tiputini (ITT). In return Ecuador was to have received financial compensation from the international community of US$3.6 billion, about half of what the country would have realized in revenue from exploiting the oil at 2007 prices. The deal would have avoided an estimated 410 million metric tons of carbon dioxide emissions generated by burning that oil. Because only $200 million had been pledged by 2012, President Correa abandoned the ITT Initiative on August 15, 2013. At the workshop today, Cardinal Peter Turkson, president of the Pontifical Council for Justice and Peace, which advised the Pope in the preparation of his encyclical, said that indifference toward or mistreatment of the planet and its resources is linked to the indifference or abuse shown to human beings.